Hot-diggety-dog! 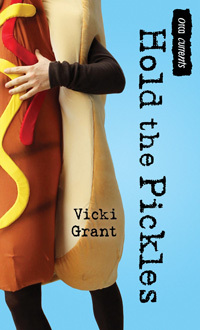 Hold the Pickles – my recent sequel to Pigboy – has just been nominated as an American Library Association Quick Pick for Young Adults. The Quick Picks list identifies books which encourage reading among teens who, for whatever reason, dislike to read. “And who wouldn’t want to read Hold the Pickles?” she asks modestly. Gross-out details? Snot? Slime? And a clever mystery? Sounds like this hotdog comes with the works. Congratulations Vicki! Great quote. Great cover. Sure to be a great read!